Every once in a great while, I read something that seems so simple and profound that I have to stop and think about it for a while. Such a moment occurred for me today, while reading Margaret Wertheim's excellent piece "The Shadow Goes," which appeared on the op-ed page of yesterday's New York Times. The central paradox of the article is that while nothing can go faster than the speed of light, shadows—being nothing themselves—can. All the laws of physics were designed to describe the behavior of things that are, not things that aren't. I'm paraphrasing. Read the article. Economics, like physics, is full of shadows. The idea of opportunity cost—the value of the path not chosen—is probably the most important "shadow concept" in economics. What is the value of the job not accepted, or the passed-over pair of shoes? What path would the economy have taken if interest rates had been raised rather than lowered? What laws govern the behavior of worlds that remain unrealized because we chose a different alternative? Does it matter? Probably not. Economics probably isn't missing a theory of non-phenomena, just as physics isn't really missing a theory of shadows. But as summer begins, and we are able to remove ourselves from the fits and starts of the academic year, it's a good time to take a step back and look at the wider picture, to filter out the noise of the myriad economic models we surround ourselves with every day, and think for a moment about the really important things we've learned and done in the past school year. There's a concrete way to do this. 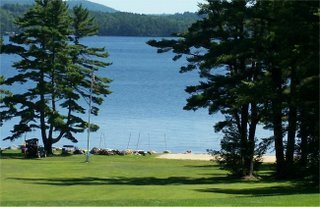 Once, when I was around eleven years old, I stood in a field in New Hampshire at the camp where I had spent the last three summers. It was a beautiful evening, warm even for a New England July. At the time, I made a conscious effort to try to record in my memory the panorama before me: the shadows of the giant trees as they fell on the lodge, the playing fields, the tennis courts, the shack where the counselors hung out, the gravel road leading to the main gate. I remember little else about that summer, but I can still remember that one scene. Just as I have forgotten most of that summer, so too will most of us forget a great deal of what we have learned in this past academic year. Now—before it is too late—take a few moments to pick one thing, one detail, that you feel is worth remembering. Then go somewhere and think about it for a few hours. Talk to a friend about it. Write about it. Then get ready for next year—there's a lot more to learn! Note: Aplia Econ Blog will return in the fall with the new academic year. (Of course, if we see something we feel we just must write about, there might be a post or two in the upcoming months.) Until then, have a great summer!